Refresh yourself within a few moments with precious range of Face and Body Spritz from Ras.An excellent way to hydrate your skin on the go, while locking in moisture and essential nutrients, to give you dewy radiance that you will adore! 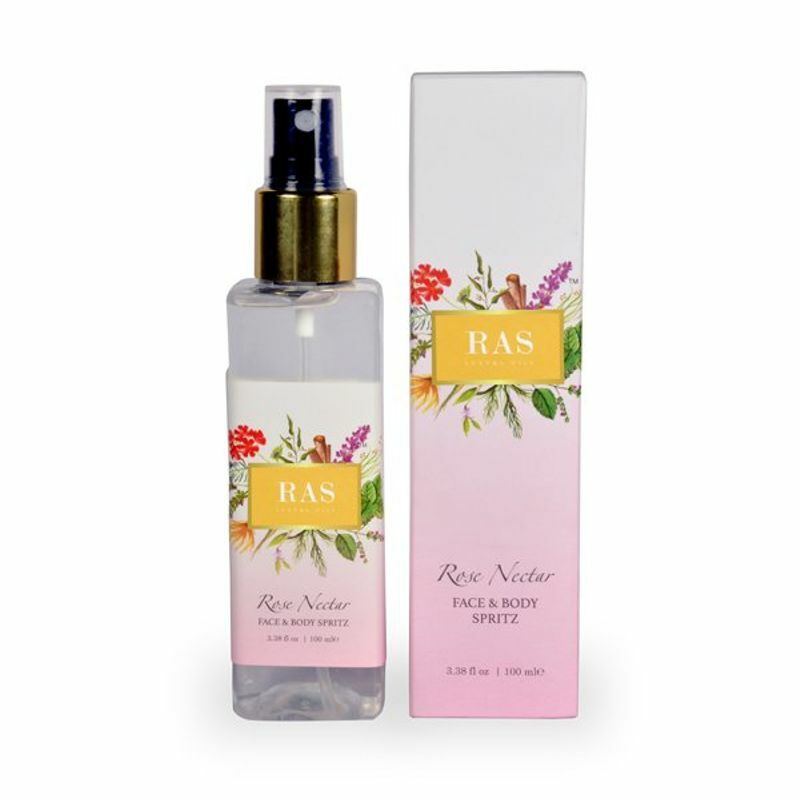 Ras Rose Nectar Face & Body Spritz with Geranium and Lavender is a hydrating concoction that revitalizes your skin to leave it feeling silky smooth, fragrant and youthful. The perfect pick-me-up for any skin type, use this spritz for a beautifully dewy radiance! It hydrates and moisturizes the skin, leaving it smooth, refreshed and smelling sweetly. Rose water hydrates and moisturizes the skin, leaving it smooth, refreshed and smelling sweetly. Lavender is highly regarded for its therapeutic properties, and aids in soothing, healing and restoring the skin. The sweet-smelling Geranium is known for its skin brightening properties as well as for its ability to alleviate stress. The fragrance effused by it helps to uplift the mood, reduce fatigue and promote emotional wellbeing. The heavenly aroma emanated by rose water is a great mood enhancer, and helps release anxiety and negativity quickly, promoting feelings of wellbeing. It can be used effectively as a natural toner, as it helps to clear the pores and tone the skin as well as treat acne and other skin troubles. Rose water helps maintain your skin’s pH balance, leaving it perfectly soft and nourished. It helps revitalize skin, keeping signs of ageing such as fine lines and wrinkles at bay. Its antioxidant properties also help regenerate the skin tissue. Rose water can also be used on the hair to nourish and enhance the quality of hair and give it a lustrous shine. It has anti-inflammatory properties that help alleviate skin irritation and redness.